Frank Moses is a retired CIA agent. He lives alone in a comfortable, pristine house, takes his pills every morning, exercises in the basement and waits for the pension check to arrive. As soon as he gets it, he tears it down in order to have a pretext to phone and talk with his social security phone crush, a woman called Sara. It is his only pastime and he has never seen Sara in real life. Yes, he is so romantically awkward, lonely and bored. Fortunately lovely Sara, although much younger than Frank, seems almost as bored with her life as him – she reads Harlequins (“Love’s Wild Secret” is her latest choice – horrible but so enticing), she goes on dates, one more botched than the other, she dreams of travelling and exotic countries. One night, though, Frank’s boredom is over. A special forces squad is sent to murder him. Who and why – you can only guess and our hero is hardly surprised. After so many years in CIA you are bound to know some dangerous secrets, right? In fact it seems he has been preparing himself for such a possibility all that time; mind you he knows every trick in the special operations books and then some. Not only he neutralizes his opponents very efficiently but also he manages to escape more or less unscathed, grabbing a bag full of documents, cash and everything a man on the run might need in order to survive for several weeks. Still Frank will be anything but alone. He goes to Sara in Kansas City and takes her away for their first date – literally kidnapping her. Then he pays visits to all his old pals who might be also targeted. They form a nice little squad on their own. Who will prevail, young CIA agents or their retired counterparts? It’s a comic book adaptation starring actors who are mostly over the age of 50 or 60. And it’s paced like a movie for older audiences, too. Technically I shouldn’t have liked it but I did. This film might be not a killer thrill ride but I admit I haven’t seen a better spy comedy for a long time. It tells you that you are never too old for a mayhem (read: fun and fireworks) in your life and the allure of firing an honest-to-god RPG outweighs the prospects of peaceful retirement and tending to your garden – a refreshingly original premise. Bruce Willis did surprise me – I hardly remember his other roles but this one was fun! A retired agent role suited him perfectly and there was one simply precious scene when he and his beloved Sara were reading the same romance novel (but, of course, for different reasons!). Overall all the actors seemed to have a lot of fun while shooting this one and it translated into a piece of effortless entertainment even though, from time to time, you must put your brain on hold, preferably with some relaxing music in the background. Not every plot twist makes sense, not everything is easily believable but who cares when Helen Mirren is killing a bunch of baddies with a big machine gun positioned on a tripod, wearing a scrumptious evening dress with make-up and an impeccable hairdo to match? Or John Malkovitch, in full obsessed-weirdo-camouflage outfit, helps her swapping glossy stilettos for sturdy outdoor boots? You would have to be dead in order not to smile! This entry was posted in movie review and tagged action, comedy. Bookmark the permalink. 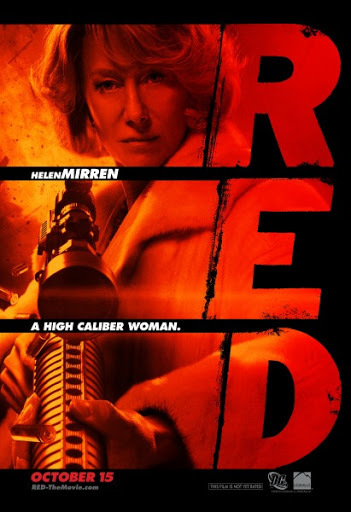 You can always tell an action will be good if Helen Mirren is in it. 🙂 I haven't watched this one, yet. One of those films that I was interested in when it first came out but forgot about. *does a little happy dance* She liked it. Why the joy? I can appreciate a good spy comedy if I see one.